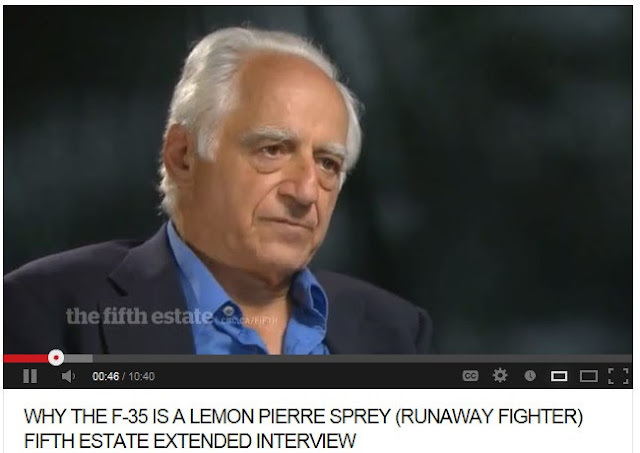 Elements Of Power: Pierre Sprey: Expert? Heh. Struck a fanboy nerve hard eh? RE: " "BVR & BVR-alone" was the fantasy behind aircraft like early F4, F14 & F111." 'BVR and BVR alone' is a strawman argument. No rational advocate for BVR capability ever assumed it would prevent WVR. In fact it was (and is) seen as being the dominating factor in setting up a successful WVR engagement if the BVR one doesn't settle the matter. RE: "Without Boyd, Sprey Christie etc, F16 would have never come into being." No, the F-16, especially as it was execut ed, was a program that came about IN SPITE of Boyd, Riccione, Christie and Sprey. RE: "F15A would have become another overly complex turkey (that would have killed F15E at birth)." Been reading Coram's cr*p fiction about Boyd or something similar eh? I'd place the F-15 requirements success on the shoulders of Lt Gen Glenn A Kent, Lt Col (Later General and AF Chief of Staff) Larry Welch and his TAC Avenger simulations, and then AFSC Commander General James Ferguson. But then, I know the history doesn't support the Boyd mythos in this case. I'd like to point out here, just to prove yet another point you don't know d*ck about, that the mythical $1Trillion value is already being pared back quite a bit and it includes all lifecycle costs for 55 years of operation in any case. Got any other weapon system data of similar scope for perspective? RE: and another disastrous air war for arrogant armchair generals (who twist arms, discredit critics & bend history) like yourself to be proven wrong. You can't really discredit critics unless they don't deserve the credit in the first place. Unbending of false history, and exposing the 'narrative' planted by the Coram's, Fallows, et al just tends to hurt little fanboy brains as they try to wrap themselves around the idea they've been spoon-fed cr*p as actual history. I can back up every one of my factual assertions with sources- usually multiple ones. I MIGHT take the time to do it and expand this comment into a separate post if you can take the time to research the correct answer to the following questions about that 'disastrous air war' you allude to. 1. What was the Navy's Air to Air exchange ratio before and after the break in the war over North Vietnam? 2. What was the root cause of the difference in exchange ratios, if any, considering the Navy was using the same aircraft and weapons before and after? 3. What was different about the AF and Navy experience in exchange ratios and why was there a difference? HNS: I had to give you a chance per stated policy to prove otherwise. Since you're hot and online there Twinkles, be specific about what you think I get wrong about the LWF and Boyd or get erased, also per stated policy. I'm on vacation and got plenty of time to slap you around and still do what I want to do for the next week or so, so I got no heartache either way. You got thirty minutes as of...now. Buh-Bye "HMS"...Who curiously showed up at my place about the time my comments disappeared at the YouTube link above. Wow 'picard'. The 'low information' types really sucked up Sprey's B.S. didn't they? I didn't hear him utter one materially accurate sentence. I don't know which is sadder, Sprey's ramblings or that poor woman(?) off camera who clucked as if he/she had received a revelation from heaven whenever Sprey went off the deep end with one of his standard tropes.